It is interesting how certain wines remind you of other totally unrelated wines previously consumed. The same can be said of people. Sometimes these similarities can be good things or not so good. I notice things about Beatrice that I remember happening with Ben, but I know they're completely different people. I sometimes find myself tasting a wine and think it is something else when I know it can't possibly be. I've been put off by wines that reminded me so much of something I didn't enjoy in the past, only to be surprised when the labels were revealed. But the best instances of these mistaken identities are when you taste a wine that is a dead ringer for something either rare or much more expensive. Well, this week's rosé fits into that category. 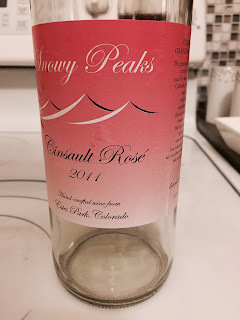 The first thing that popped into my mind when I smelled and tasted this Snowy Peaks Winery 2011 Cinsault Rosé (Table Wine abv, Purchased $16) was Sine Qua Non. I know, that sounds blasphemous, but this wine really did remind me of the two times I had Manfred Krankl's ridiculously expensive (market value) pink wines. I've only had the 2008 "The Pontiff" and the 2002 "E" rosés. This Colorado Cinsault rosé had the abundant fruit fragrance and richness of body that I remember so distinctly with the Sine Qua Non rosés. The Snowy Peaks was a very dark pink - almost a pale red in color. Cherry and strawberry aromas exploded from the glass. It still so fragrant and so fruity for a rosé that is five years old. It didn't have the overall complexity or richness I found in the SQN wines, but this still had flavors of black cherries, pie spices, and vanilla - along with a subtle hint of silky tannins. It is much more reminiscent of a light red than a dainty rosé. Now, I can't say what would happen if you put a Snowy Peaks rosé next to a SQN rosé blind, but I will stand my ground when I say that this wine brought me back to having a $350 bottle of rosé in my glass for a mere fraction of that astronomical price. Yes you are right when you taste a wine that are more expensive or rare its remind you many thing. I have taste a really expensive wine in 2011 at my father's friends party it was awesome.